The Asiatic Lily is a gorgeous flower that blooms facing up, forming a spectacular star shape. The flowers petals display vibrant colours blended with soft tones. Its striking colours and delicate freckles would make your wedding bouquets or flower arrangements stand out. 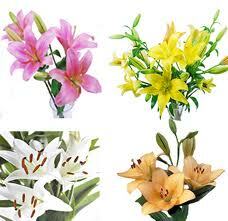 Get the freshest of Asiatic Lilies delivered by us at wholesale rates.